When you click a Spotify playlist folder’s name (as opposed to an individual playlist), all tracks filed in that folder appear in the main window. They aren’t categorized by the playlist they’re in. So, you can start to play all the tracks in that folder, no matter what playlist they’re from, as opposed to the tracks from an individual playlist. Sort the tracks in a playlist or playlist folder by clicking the top of the column by which you want to sort. For example, you may want to view tracks alphabetically, so click Track to change the view to alphabetical order; click Track again to view them in reverse alphabetical order. Click a third time to go back to the original view. A small up or down arrow appears next to the column to show you which view you’ve selected; the arrow disappears when you’re viewing tracks in the order they were initially arranged. Other columns available for sorting include Artist, Time (track length), and Album. When viewing individual playlists, you can additionally sort tracks by user and the date a track was added to the playlist, which is handy if you subscribe to a playlist that’s frequently updated by its creator and you want to see the new stuff she’s just added. Make sure you turn sorting off and go back to a playlist’s original view if you want to rearrange tracks! You can filter tracks to narrow down a track listing and confine it to, say, a particular artist or album. 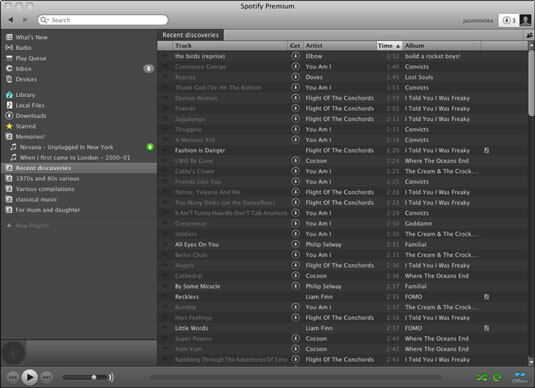 Press Ctrl+F (Command+F on a Mac) when you’re viewing a playlist or playlist folder to bring up the Filter text box. Start typing the name of what you want to narrow your view to and watch your track view narrow down in real time, according to what you’re typing.